The world as you have known it is about to change. Not for everyone, but for those who harness the power of the network marketing business model as a catalyst of change. The beauty of this business you’ve engaged in is that you are not having to pioneer something new or something that’s never been done before. Actually, you should be excited that the network marketing profession has already created thousands of millionaires and countless stories of people replacing incomes, quitting their jobs to work for themselves, or creating additional income streams. Network marketing is the ultimate business model for creating leverage — both of time and of income. Network marketing will allow you to own a business that you can design to fit around your life, while a traditional business requires you to fit your life around it … and hence it owns you. You are not entering into an abyss of the unknown. It is not that freedom has never been achieved in this business model before. There are thousands who are living the dream life already. In fact, this book will provide you the blueprint or roadmap to guide you step by step through the process to achieve what the other success stories have achieved. You work for no one, you are the owner of your own business, you earn income from the efforts of an army of others, you call your own shots, you have no ceiling on what you can earn, and you make a living while making a difference! Show me another way in which I can have fun, make money, and help others — all at the same time — and I am right behind you. I have never found a better way than network marketing. Now let’s tap into the greatness that is planted inside of you and create something magnificent that you can be proud of. My goal with this “Building an Empire” is to give to you $1 million worth of knowledge for the cost of a dinner at a medium rate restaurant. I have read several books on network marketing over my 18 years so far in this profession, but few I would recommend to my team to read. Most of the authors I read had never personally built anything substantial, at least not as big of a business that I was seeking to build. So I decided to fill that void, and give those who seek it the inside look at how I learned to build one of the industry’s biggest teams. But before we begin, let me humbly say that I learned so much by gathering knowledge from so many. I was fortunate to have incredible mentors, both near and from afar. Since it didn’t exist — and I always wished I had one — I wanted to write the ultimate, complete A-Z blueprint on everything it takes to go from scratch to a seven figure income in network marketing. 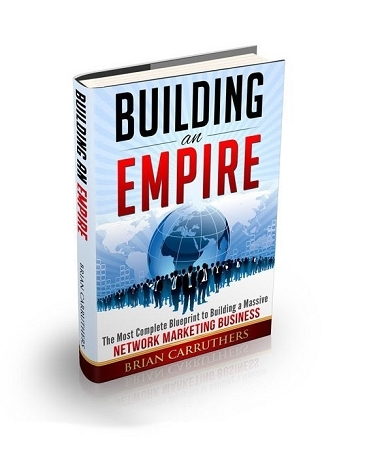 This book is designed to be your “everything resource” for your entire career in building your business into an empire. My goal is for this book to be held up in the air during many top award acceptance speeches, attributing it to the massive success the industry’s new top earners have experienced in their rise to the top.